This is the view down our driveway. 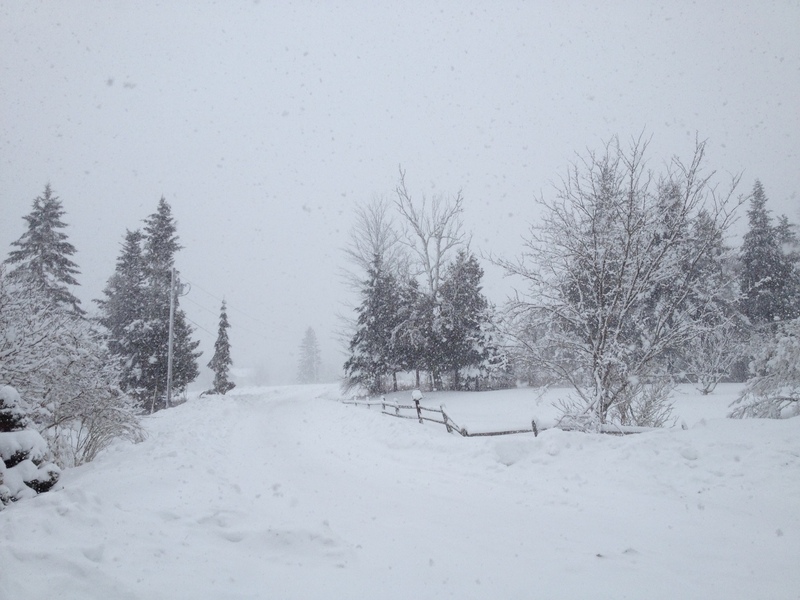 It just keeps snowing and snowing and snowing some more! March 13th! 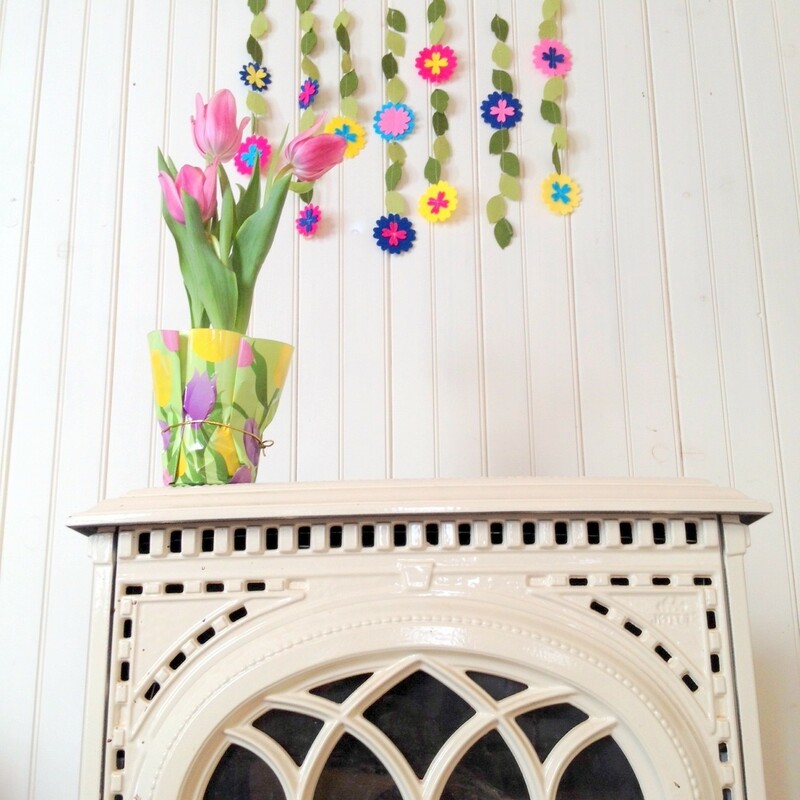 It has snowed at least 18″ in the past 24 hours and it’s still snowing, but spring has sprung in our house. 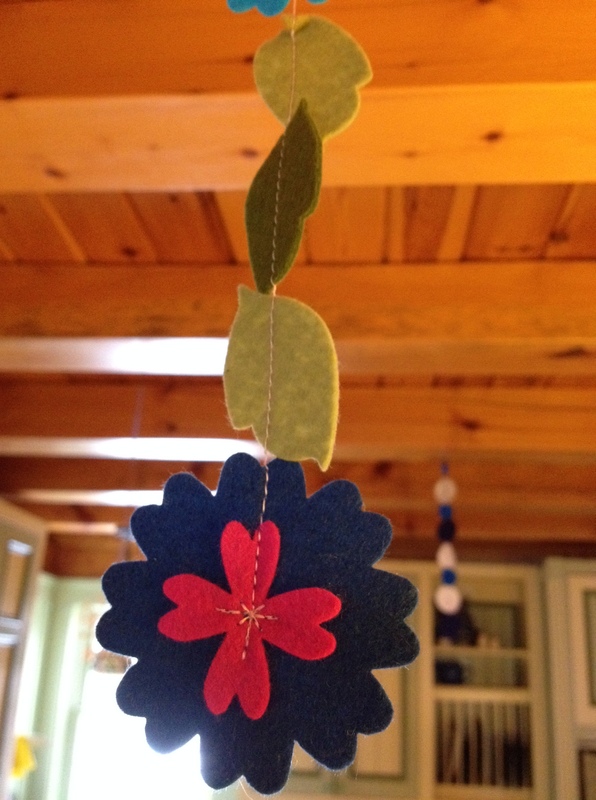 Last night before the impending storm, and shortly before losing power, I quickly stitched up some leaf and flower garlands to hang around our kitchen and dining room. (We have an open floor plan, so it’s all one space). Up with the new (springy flower garland) and down with the old (you can see one of the blue and white snowflake garland strands in the background). 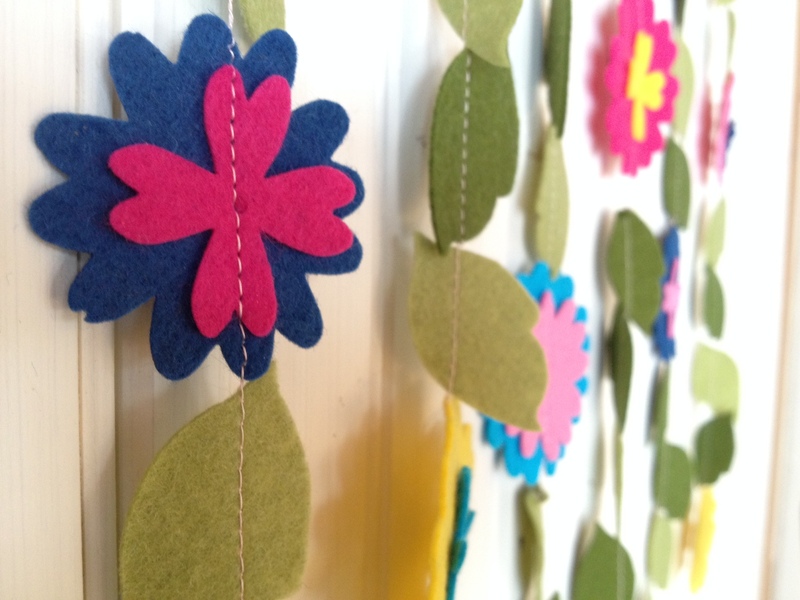 Last year I cut all of the felt circles for my snowflake garland myself, and when I first had the idea of making a similar springy one, I toyed with the idea of cutting my own felt flowers and leaves… but not for long. Without a die cut machine, I decided it would be much easier, and therefore more likely that I’d actually make these garlands, if I simply ordered the shapes on Etsy. Felted Fringe had exactly what I wanted, with options for color customization, and extremely reasonable prices. Done and done. Without further ado, behold the springtime. Our kitchen area isn’t very bright, so I had an impromptu spring has sprung photoshoot in our entryway. I had so much fun with it! Those are so lovely… I may have to steal this idea this week-end and have my daughter jump on the machine with me. I have all this beautiful 100% wool felt that I’ve been keeping for something special! Thank you! 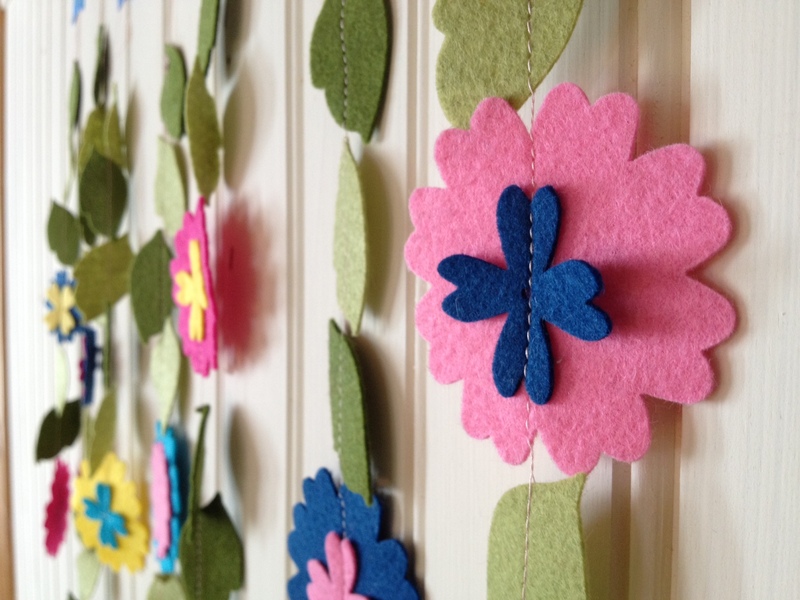 I love felt garlands; they are so simple to make and really help brighten a home for the passing seasons and holidays! 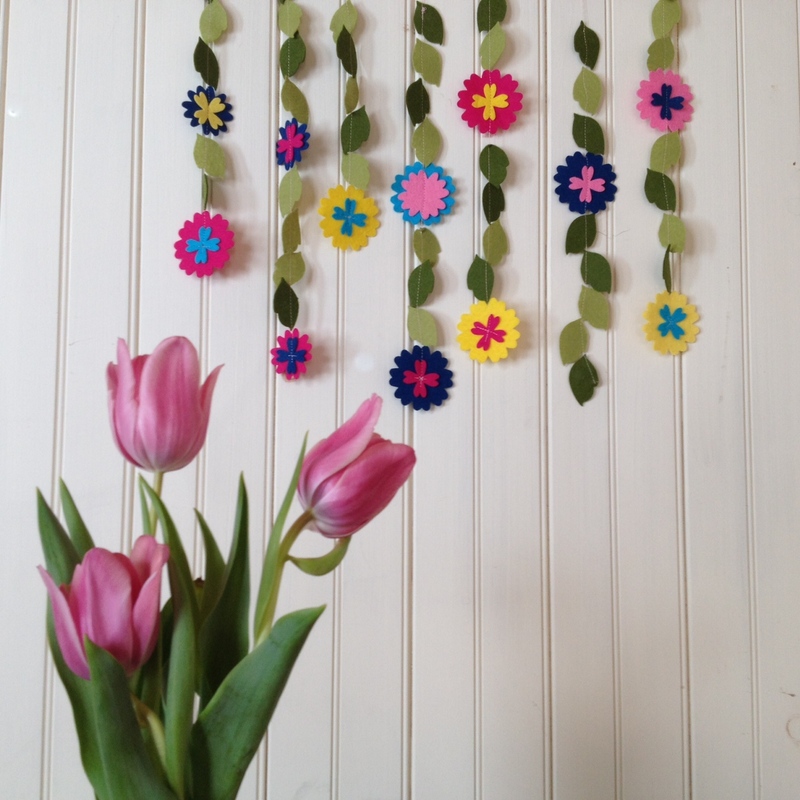 My 4-year old daughter wants some flower garlands for her room now, so we may be making some more this weekend, too! I would love to see yours if you do end up making some! As for spring–yes, indeed! It has to be on its way, even if it’s arriving like a lion 🙂 We have our seeds planted under grow lights, our spring flower garlands up, a potted tulip to smell in passing throughout the day… we are ready! I will for sure! 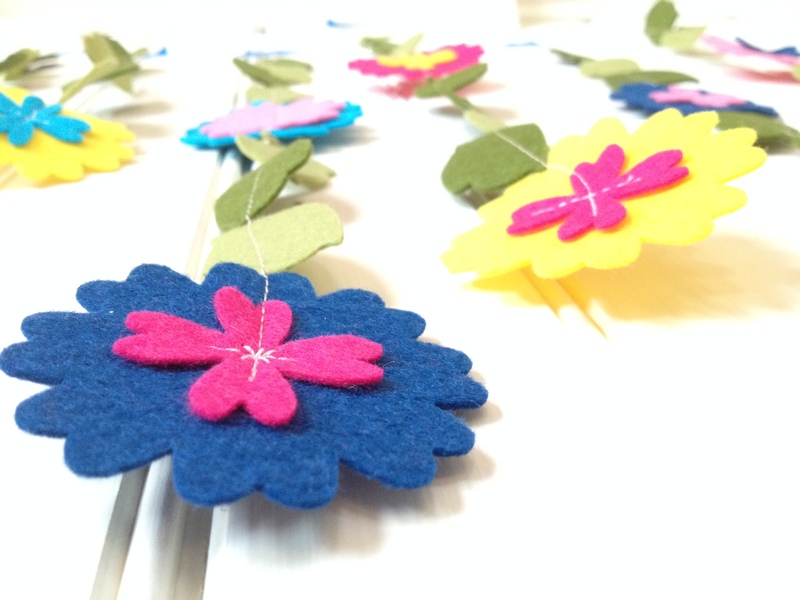 Do you use wool felt or poly felt? These are made out of wool felt, and I try to use wool when I can! I feel like wool felt is thicker and nicer than poly blend, although I’ve used poly blend for kids’ projects, like finger puppets. I love wool but I’ve been having to order it online because I can’t seem to find it in the craft stores here. 🙂 I prefer it too. I ordered these flowers online, but normally I get wool felt at my LQS (local quilt store).